Flying Solo – single parents, second chances and the power of love..
Abby Mackenzie, a psychologist treating first responders, needs an R & R after a patient’s suicide. Her solution is hard physical work during the day so she can sleep at night. Picking apples in the fresh air of New England—far away from her home in L.A.—may be just what the doctor ordered. 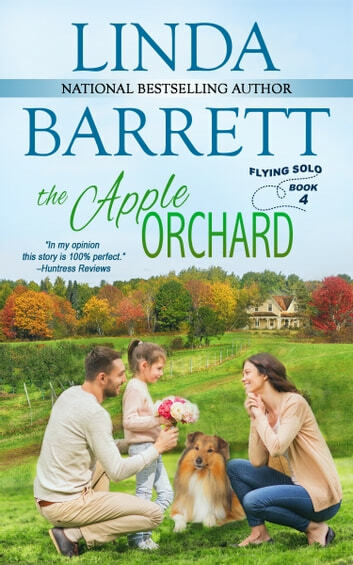 Her aunt’s friends own a thriving orchard and hire her. The large Templeton family greets her warmly as both a worker and a guest. All except Dr. Jake Templeton, who doesn’t want Abby befriending his unhappy young daughter. He’s suspicious of the mental health profession in general, as well as Abby’s need for what she calls her ‘sabbatical.’ So far, four therapists have failed to help his child deal with her mom’s death two years earlier. 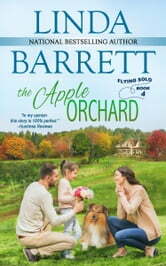 As the apple season progresses, however, the little girl seeks Abby out. Jake watches, worries and tries to protect Stacy. And finds himself falling for the sensitive and lovely woman hiding from her past. Will these two shattered hearts complete a journey from sorrow to joy and reclaim their faith in the future?